Doesn’t it feel great to write on paper instead of typing? There is a certain joy to writing and sketching on paper that doesn’t compare to electronics. In an industry dominated by Moleskine, paper notebooks have slowly been increasing in popularity. Whether you want to spend a couple dollars or a couple hundred, a great journal should always be perpetually inspiring. Full of thoughts, ideas and memories while standing the test of time and always providing a quality writing experience. 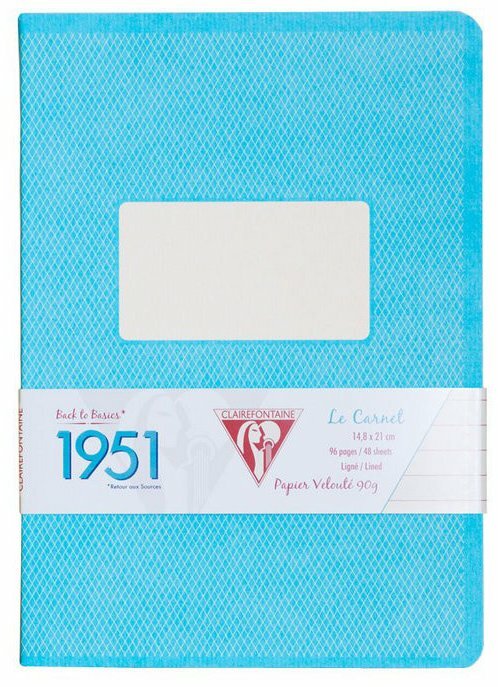 For a fantastic all-around paper notebook that fits this, our quick answer is to buy an excellent French Rhodia Webnotebook or a German Leuchtturm notebook. For a pocketbook you can’t go wrong with Field Notes, and for something a bit larger take a look at the Japanese Maruman brand. But remember, picking a notebook you’ll be using for years is a very personal choice, so keep reading to learn about what makes a great notebook, or skip ahead for notebook brands we recommend and don’t recommend. Variations in durability, paper quality, paper weight, binding method, materials, where the paper was sourced and so on, all combine to create a unique paper surface and notebook. 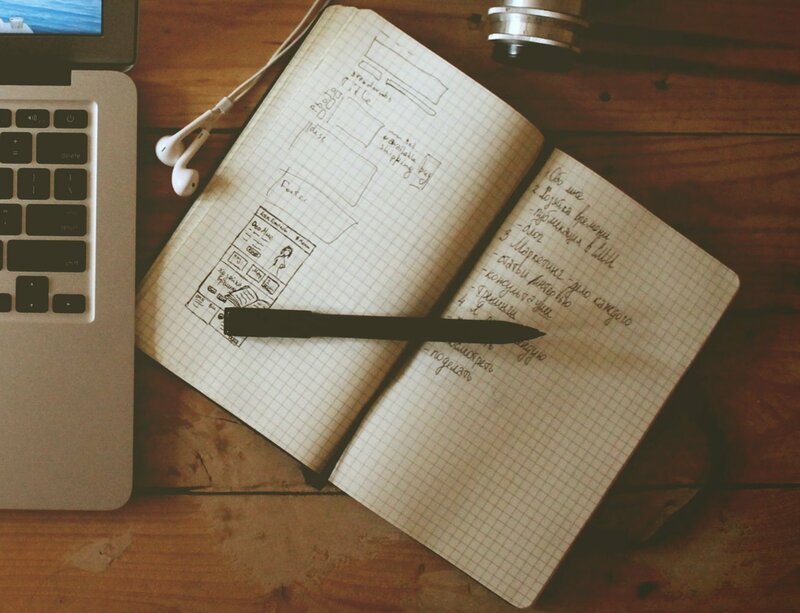 Brands have different combinations of these factors that elicit a different writing experience. Some brands have similar designs, but have vastly different paper quality. Other brands may only produce limited styles that focus on certain types of pens (such as fountain pens). What many people miss is that the writing experience depends as much on the quality of the pen as the quality and type of paper being written upon. Are you using a brush pen? Are you doing sketches? 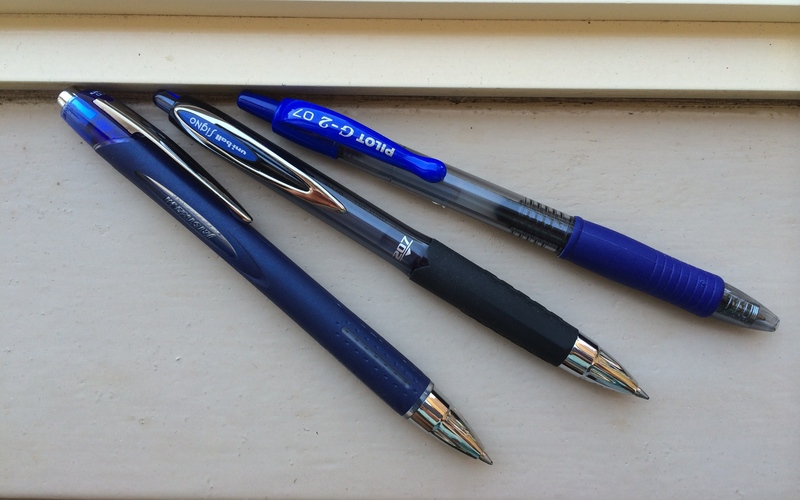 Are you using a fountain pen or a ballpoint pen? The type of pen you use and what you’re going to be doing with the notebook should strongly effect your buying decision. So let’s start from the beginning on what makes a paper notebook. Paper style / ruling — A paper’s style and type of ruling often determines its function. There are various styles out there, but most notebooks contain either blank, lined, lined with margins, graphing, or dot grid paper. Lined paper is usually only for writing, whereas blank paper is more commonly used for sketching or visual writing. Dot grid paper can be used for writing, sketching, drawing or anything you might find easier with a grid. Graphing paper is most often used in engineering, designing or scientific fields where you need to record diagrams and measurements. Sheet size — Or paper size. 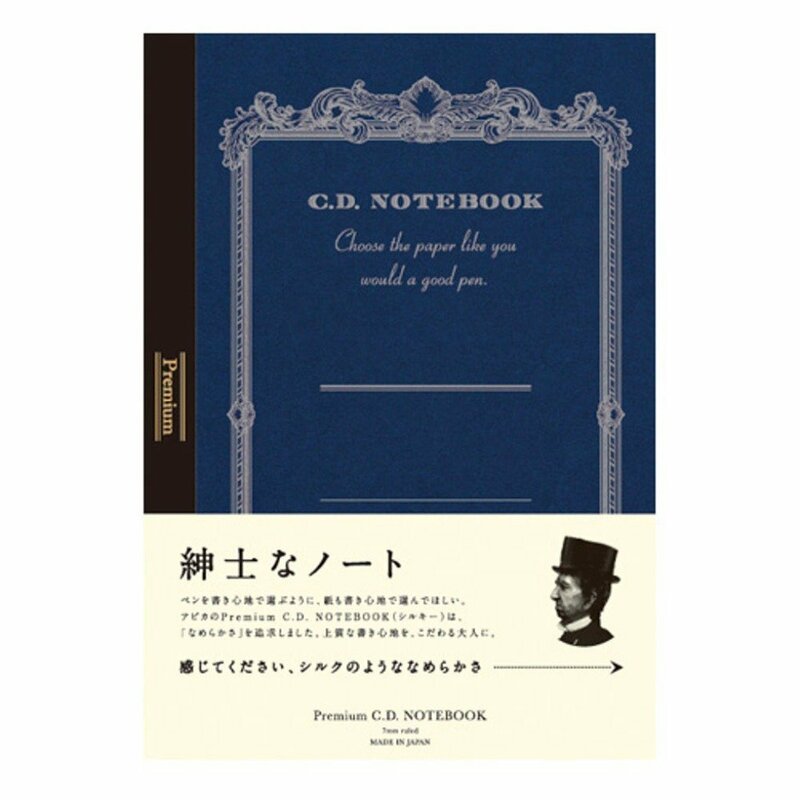 Standard notebooks that come in letter or legal size will be A4 size (8.27 inches x 11.69 inches). These are the most common and work best for most school or professional situations. Smaller notebooks that are half this size are A5 (5.83 inches x 8.27 inches). For pocket sized notebooks, you’ll want A6 (4.13 inches x 5.83 inches). Another popular size is B5 (6.93 inches x 9.84 inches) that is between A4 and A5 in terms of sizing. Its not as big as a standard notebook but also not too small that you won’t have enough room. Number of sheets — How thin or thick do you want your notebook? Just remember, the more sheets you have the heavier the notebook will be. If you want a lot of pages but still need it to be light, look for notebooks with a lower paper weight. Paper weight — Refers to the paper’s GSM or Grams per Square Meter. If you were to take a square meter of a particular paper, this is how much it would weigh. A higher GSM therefore means a heavier and more durable paper, but not necessarily higher quality or thicker. GSM does not always correlate with thickness. Two sheets of paper can have the same GSM but one can be much thicker while the other might be thinner and more tightly packed. If you want to sketch or write on both sides, you’ll want paper with a higher GSM. Standard printer paper is around 80 gsm while a business card is around 400 gsm. Paper color — The vast majority come in a soft cream color or a crisp white color. Paper brightness and color varies between brands and manufacturers. For fountain pen users, you’ll usually want a clean white paper for ink to display its proper colors. Material and design — Some brands are known for their specific styling, colors, or use of materials. Generally this refers to notebook covers which can range from flexible plastic, chipboard, cardstock or leatherette. Rounded corners are preferred for durability (they are worn down less compared to square corners). Some notebook covers also have pockets or contain loose leaf paper. Binding — This is how the paper within the notebook is bound or combined together. The most common binding methods are glue, staples, spiral, ring, or stitched/threaded. Glue binding is not as secure and durable as other types of notebook binding. Glue-bound notebooks usually do not lay completely flat (except for newer types of glue binding), and sometimes they are designed to have easily removable pages (often sketchbooks). Staple binding (sometimes known as saddle stitching) is often used to make thinner notebooks (less than 64 pages). The middle of the notebook is stapled and pages are folded over. 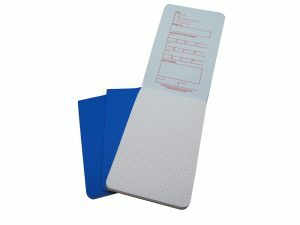 Notepads with staple bindings are stapled at the top and pages are removed or folded backwards over the top. Spiral binding is when a spiral wire is run through the pages and notebook. This can be quite secure but also annoying because the spiral can often rotate and move as the notebook is opened and closed. If you want a spiral bound notebook, we suggest a tightly wound spiral binding that is stronger and moves less. Ring binding is the strongest and most durable of all the bindings but also the heaviest and bulkiest. Ring binding (wirebound) comes in either single or twin rings and allows for notebooks to lay completely flat. Threaded or stitched binding is when the middle of the notebook is stitched with thread and the pages are folded over. This is similar to staple binding except that threaded binding is stronger, more rigid and can hold more pages. There is also a less common binding that is a combination of thread and glue binding that is sturdy, tightly bound and can lay flat. Perforation — These are the tiny holes you see near the paper binding allowing you to easily tear the paper from the notebook. These are most useful for school or professional settings where you often need to remove paper sheets. Feathering — This is when ink seeps into the paper’s fibers and spreads (feathers) creating an unattractive web-like appearance. Higher quality paper will resist feathering. Bleed-through and show-through — If paper is too thin and the ink too heavy, the ink will bleed-through. Thicker paper will have greater opacity and less show-through (how much ink you can see on the other side of the paper). In particular, fountain pen paper is thicker and woven to reduce bleed-through and show-through. Dry time — This depends on a paper’s absorbency. Higher absorbency equals a faster drying time. However, the more absorbent and faster drying the paper is, the less smooth and the more rough the paper is. Different brands find a different balance between dry time (absorbency) and writing smoothness. Smoothness — Paper often has a coating that effects smoothness and absorbency. A smoother paper makes it easier for a pen to glide while writing. Uncoated paper will be rougher and more difficult to write on. For fountain pens, the best is half coated paper for a good balance between dry time and smoothness. However, personal preferences will vary. Acid-free paper — Paper that has had the acid pulp removed and is treated to be pH neutral (pH level above 7). This type of paper will usually be lignin free and will last between 50-100 years (depending on environmental factors) and is designed to preserve documents and art. Any decent notebook brand will use acid-free and pH neutral paper. As an example, newspaper is not acid or lignin free and will degrade over time. 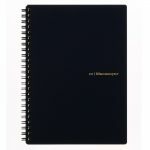 Refillable — Some notebooks are refillable, meaning that you keep the cover but can replace the notebook or paper inside. Before we begin, lets just spend a moment talking about Moleskines and why we do not recommend them. Many people don’t even remember how they got their first notebook but there’s a good chance it was a Moleskine. 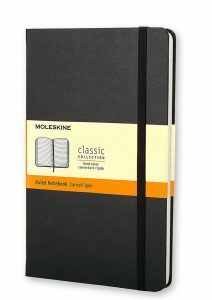 Moleskine’s hardbound 70 gsm 8.25″ x 5″ Classic Journal can be conveniently found almost everywhere. If you already own a Moleskine and love the simple black notebook then all the power to you, but there are definitely better quality notebooks for similar or cheaper prices. Moleskines are the most popular notebook brand because they have the biggest budget and the best marketing. They cost what they do not because of their quality, but because of their exhaustive marketing. In terms of quality, Moleskine would be considered middle of the pack. To be fair, Moleskine has been around for a very long time and they’ve helped to popularize writing in paper notebooks in the digital age. But over the years their paper quality has gone down. They’ve changed paper sources, changed countries and outsourced their manufacturing to Chinese factories. This wouldn’t be a big deal if their paper quality had stayed the same or improved, but it didn’t. One of their big problems is inconsistency in their paper quality because they are constantly changing paper sources. If you purchased two identical Mokeskines, they may look identical but there’s a good chance the pen you’re using will perform and feel differently in each notebook. They also do not handle fountain pen ink well at all and have a lot of bleed-through, show-through and feathering. While Moleskines are decent overall, there are better brands whose price is truly reflective of their paper quality and paper sourcing. 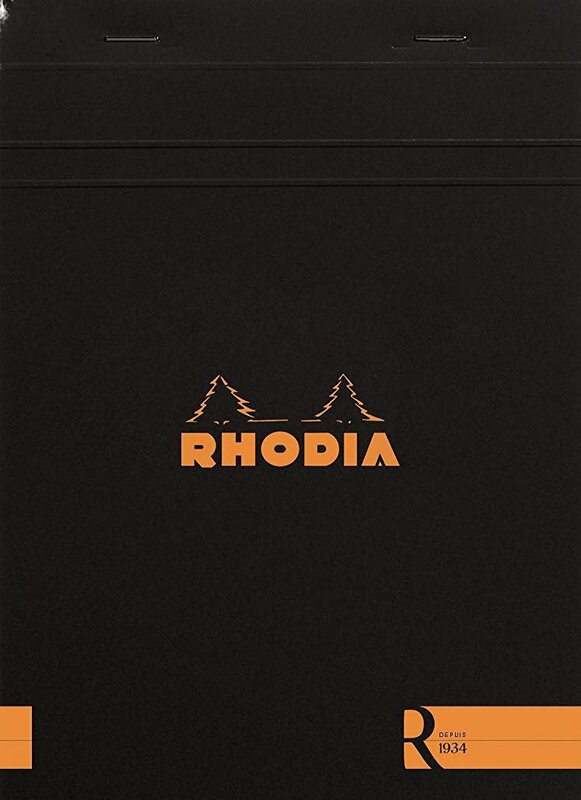 The best all-around notebooks come from the French manufacturer Rhodia. They stand ahead of all other brands (except a couple Japanese brands) for having exceptional paper quality and offering a huge variety of notebook styles at a mid-range price point. Their notebooks perform extremely well and offer a very smooth writing experience for their price. They also have a unique style with their well-known orange and black aesthetics. 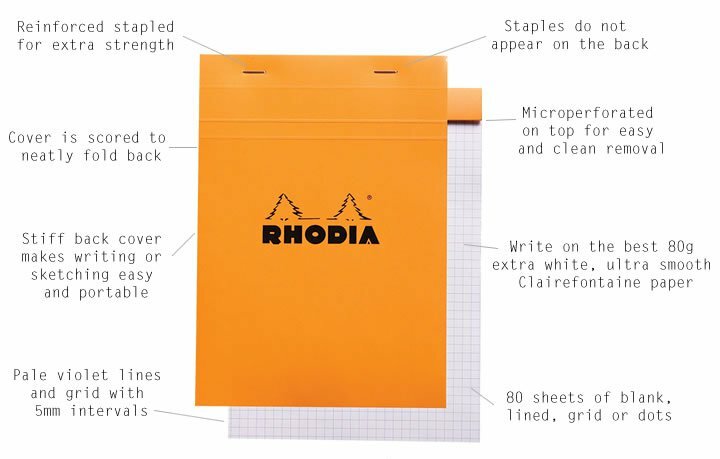 Rhodia is a very old brand (founded 1934) out of France whose paper is produced by the original Clairefontaine paper mills (founded 1858), famous for their unparalleled paper quality. Their paper is super smooth and supple and fountain pen friendly, which means it resists feathering, bleed-through and show-through with a low dry time of about 10 seconds. 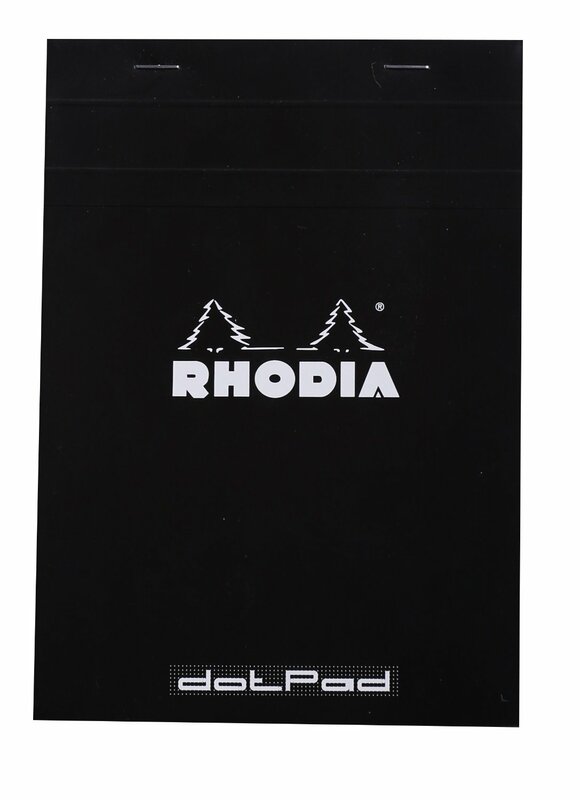 There are a few other comparable brands in terms of paper quality, but none have the availability or offer the variety and notebook options that Rhodia does. From blank paper, lined, graph, dot grid, certain shapes, perforated, hardbound, different bindings — everything is covered. We happily recommend them and you can confidently use any type of pen in your Rhodia without worry. If we had to choose one specific notebook from them, it would definitely be the 90 gsm Rhodia Webnotebook, also known as the “Webbie”. If you prefer a notepad, we suggest Rhodia’s classic orange notepad pictured below. If you want a comparable alternative to the the Rhodia Webbie, then take a look at the German Leuchtturm1917‘s medium A5 hardcover notebook. 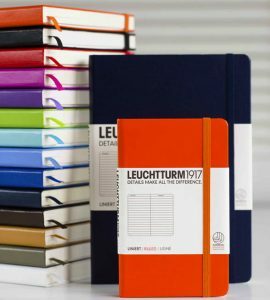 Leuchtturm notebooks are like Moleskines (70 gsm) with higher quality, better paper at 80 gsm and more small details. They are also the same price or cheaper than Moleskine. Compared to the Rhodia Webbie, Leuchtturm medium A5 notebooks are slightly wider and have a true hard cover (which can be easier to write on in your lap). The cover of the Rhodia Webbie is a bit softer but feels little less bulky in comparison. Leuchtturm’s tagline is “details make the difference” and they really do put effort into the small things. While Rhodia has a smoother and creamier paper quality at 90 gsm, Leuchtturm notebooks each have an index, numbered pages, two bookmarks in different patterns and sticky labels. They are more geared towards general productivity and are great for projects. However, you could still make your own table of contents or have your own bookmarks with the Webbie (which comes with one bookmark). Both notebooks also have an elastic and both lay flat. In terms of size, the Leuchtturm medium A5 notebook is quite a bit thicker with 124 sheets (249 pages) compared to the Rhodia Webbie’s 96 sheets (192 pages). In the end, it always comes down to personal preference. Rhodia has smoother, higher-quality paper and less bleed-through and show-through (although you’ll mostly notice this with fountain pens), but Leuchtturm makes up for it with more pages and small details that the Webbie doesn’t have. If you want a hybrid notebook for sketching and writing, a high quality alternative is Baron Fig. Founded through Kickstarter, Baron Fig primarily sells and markets online. They are very focused on the feel, branding, design, and creation aspect of their notebooks. 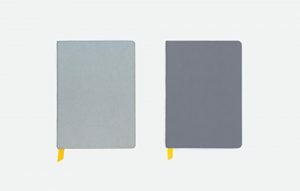 Their main product, the Baron Fig Confidant has a unique cloth-wrapped cover and is slightly shorter and narrow than an A5 notebook. This size feels lightweight but sturdy in your hand and lays flat. Baron Fig has paper similar to Leuchtturm but a bit heavier at 100 gsm. Their paper feels soft but more toothy and quite different from a lot of other notebooks, providing great feedback for drawing but also being smooth enough for writing. For pencils, gel pens and artist pens the paper is great. Not so much for fountain pens as the ink tends to feather and have a bit of show-through. The Confidant has 96 sheets (192 pages) with the last 12 pages being perforated. However it doesn’t have an elastic to hold it closed and the yellow bookmark ribbon frays easily. Currently they only have two color options, charcoal and light gray. But the great thing about Baron Fig is that they are very responsive to feedback. We have a feeling this company will grow and hope to see them add numbered pages or a different ribbon in the future. You will be hard pressed to find a similarly sized notebook at 100 gsm with great paper quality like this. 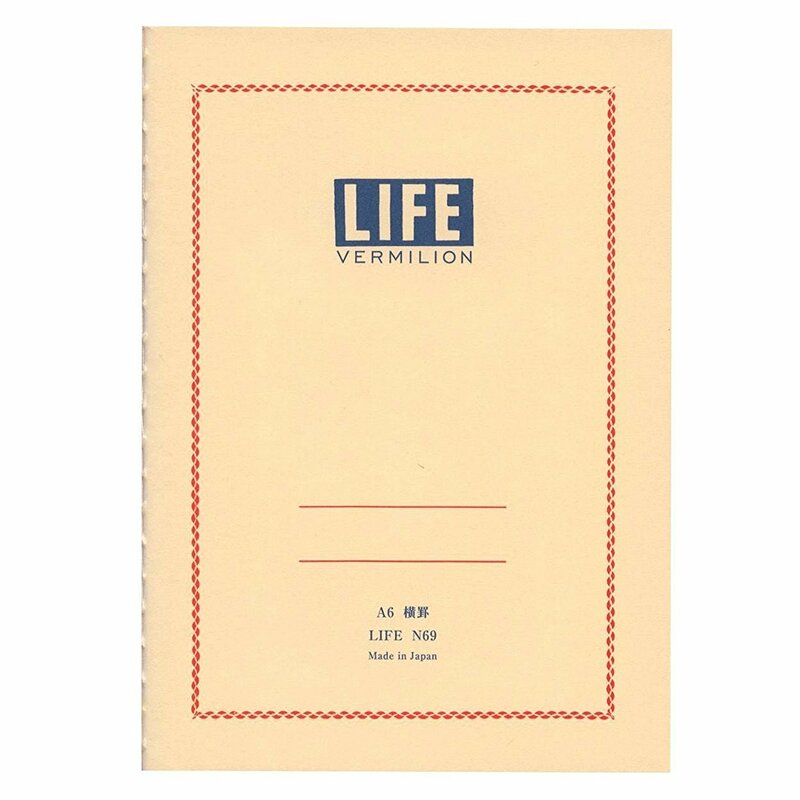 The truth is that Maruman is an amazing Japanese notebook brand. However we didn’t recommend them as the best all-around notebook because their notebooks are difficult to find and they don’t offer the variety and selection that other brands do. But we still highly recommend their very popular Maruman Mnemosyne notebook series if you can find one that fits your needs. 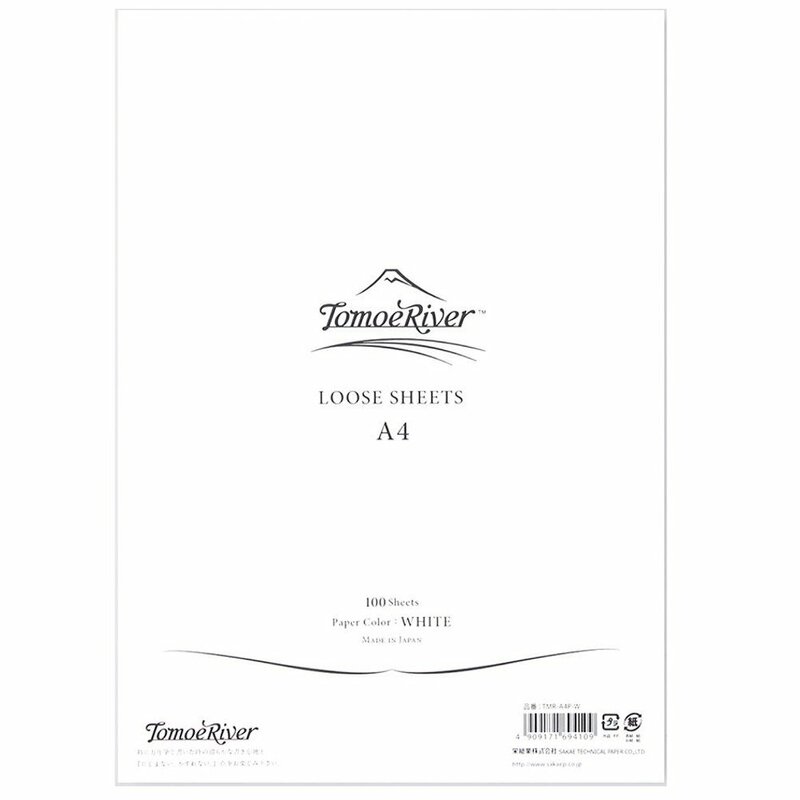 Particularly their large format A4 and A5 notebooks are fantastic for writing or drawing in with any pen or pencil and many professional designers love to use them. 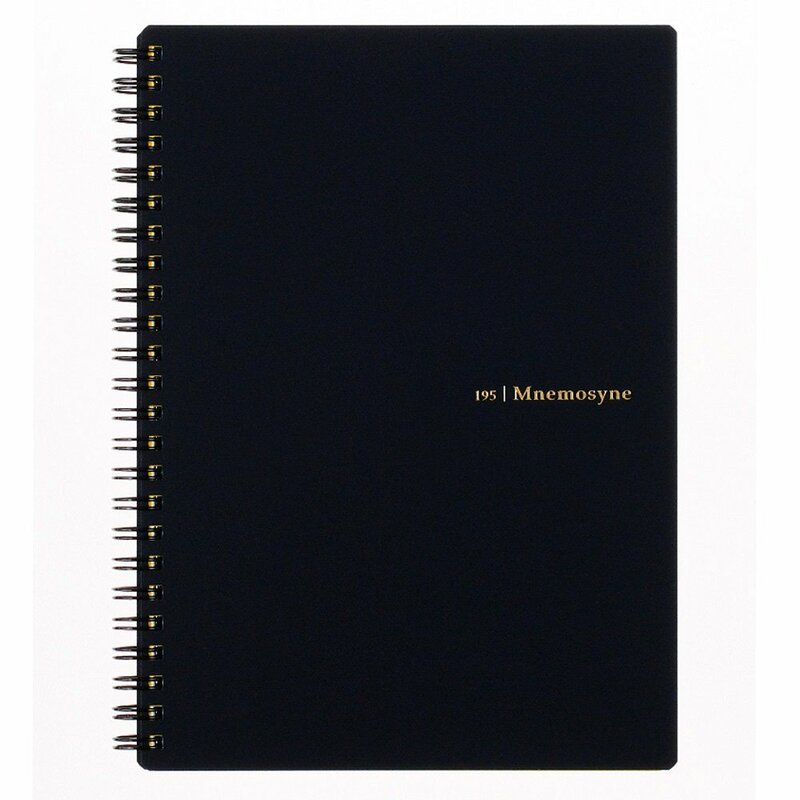 Their Mnemosyne notebook series is named after the ancient Greek God of memory, Mnemosyne. This series comes in three different layouts and has a memo/to-do list style, hence the name Mnemosyne. The Maruman Mnemosyne series is instantly recognizable for their black double ring binding (wirebound), textured black covers and simple Mnemosyne branding. Each cover has a small number next to the Mnemosyne name that indicates the model number of the notebook. The front cover is a thin, flexible, very durable plastic that is liquid resistant, and the back is a sturdy cardboard binding. Most important of all, the paper inside is some of the best you’ll find. It won’t be as smooth as a premium Clairefontaine, but the 80 gsm off-white paper has a very similar weight and feel to Rhodia paper. The big difference is that it gives more feedback which is better for drawing and sketching. It also performs excellent with fountain pens; it has medium-low show-through and no bleed-through even with heavy inks. Dry time is about 10 seconds. The paper color is also a creamier color compared to the bright white of Rhodia, and the ruling is a faint gray that contrasts nicely with the cream color. The paper is perforated for clean tears, although because the Mnemosyne notebooks all have a ring binding, you could tear the pages anyway if you wanted. The main thing you need to decide is what style of Mnemosyne you want. The three styles are Creative, Basic, and Notepad. 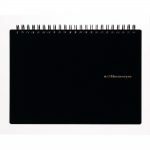 The creative style Mnemosyne notebooks are landscape style and top-wirebound notebooks. These are designed for drawing and sketching and have been extremely popular with professional designers. The A4 size is called ‘Imagination’ and the A5 size is called ‘Inspiration’. Both have a 70 sheet count and come in either blank or graph ruling. Their graphing paper is unique as far as we know because it has graph ruling on the front but is blank on the back. Between the A4 and A5, aside from the size, the main difference is that the smaller A5 only has a space for a title at the top whereas the A4 has a spot for a title and the date. The Basic Style Mnemoysne notebooks are side-wirebound with a more traditional layout. The layout is the same for all sizes — 7mm line ruling, date space at the top left, room for a title, and then each page sectioned into 3 areas (4 in the large notebooks) with bold lines. This turns out to be a nice way to separate different ideas, notes or thoughts throughout the day. Remember, this notebook series is designed for organization and memo taking and has many details to help with this. The smallest notebook in the Basic Style actually has a checklist on each page within the lined ruling. Lastly, the Notepad Style Mnemosyne notebooks are top-wirebound notepads that come in some interesting sizes at B6 (7mm line spacing), B7 (5mm) and A7 (5mm). Each page has space at the top for the date and title and each page is separated into thirds by bold lines. These notepads are cheaper and a bit more disposable only having 15 sheets. They are simple and great for jotting down notes but they might be more difficult to find as they are not imported as much as the other styles. For the best cheap notebooks but will still great quality, we highly recommend the sleek and simple MUJI A5 or MUJI B5 notebooks. 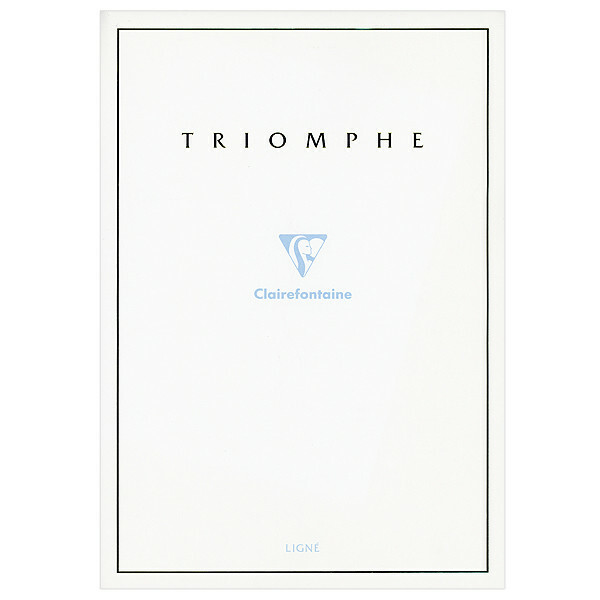 This Japanese brand is very popular and offers fantastic value for their paper quality and binding. Each notebook comes with 30 sheets of paper and usually in multicolored packs of 5. They are cheap, lay flat and consistently have good paper. There is some feathering and bleed-through for fountain pens, but for a cheap notebook its pretty great. MUJI also has some great gel ink ballpoint pens! Pocket notebooks are a slightly different animal than larger sized notebooks. They need to be light but have smooth and durable paper, thin pages to reduce bulk and weight and a fast dry time so it can be used at a moments notice without worrying about smudging. The notebook also needs to lay flat but also open easily. For this, you’ll want a notebook with a staple binding (saddle stitching) or a combination of stitching and glue. Glue binding by itself isn’t durable enough and sometimes has trouble laying flat, and spiral binding is too heavy or gets bent too easily. Many different brands make pocket sized notebooks but there’s one major brand who dominates the small pocket notebook market — Field Notes. True to their marketing, they really do make beautiful pocket friendly notebooks. Its their primary product and for good reason. Their notebooks are pocketable at 3.5″ x 5.5″ and 48 pages and come in blank, grid or lined. Each notebook has a sturdy cardboard cover and three strong staples that allow it to lay flat. The paper quality is good with a very fast dry time and most importantly any pen ink will be dry by the time you close it (aside from fountain pens, which they make no claims about). We recommend Fields Notes pocket notebooks because their product is consistent and any gel, ballpoint pen or pencil you use will perform well. Their product looks great and you can comfortably fit two in your back pocket. For the outdoor types who need a notebook that will survive being exposed to the elements frequently, you’ll need a product specifically designed for this. We recommend the tough and durable Rite in the Rain tactical notebooks. 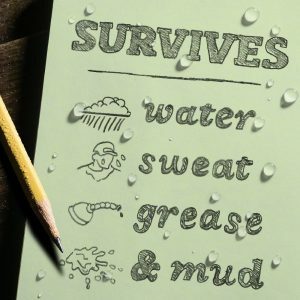 The paper in these notebooks has been treated with a moisture-resistant coating to repel water, sweat, grease and mud allowing you to write outdoors in the rain without hesitation. The paper itself will even float on top of water and won’t disintegrate like normal paper. Even fully saturated with water, whatever has written will stay on the paper. 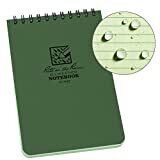 For example, if you spilled a drink on a Rite in the Rain notebook you’d still be able to read everything and continue writing on it. This paper is also useful for writing notes and sticking them in the shower for studying or leaving reminders. Depending on whether the paper is wet or dry depends on what writing instrument you can use. In wet or dry conditions, pencils, specially designed Rite in the Rain pens, wax markers and crayons will work. In dry conditions, permanent markers and ballpoint pens will work. Gel pens, most highlighters, fountain pens and water colors will not work at all on this notebook. For example, if you try to write with a highlighter, the moisture will simply bead up and can be wiped off and will not be absorbed by the paper. For most situations, it is always best to keep a backup pencil for use in any type of conditions and situations. 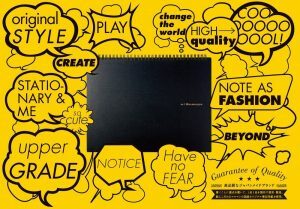 In terms of the design of the notebook, it has 50 sheets (100 pages) that are lined on the front and back. 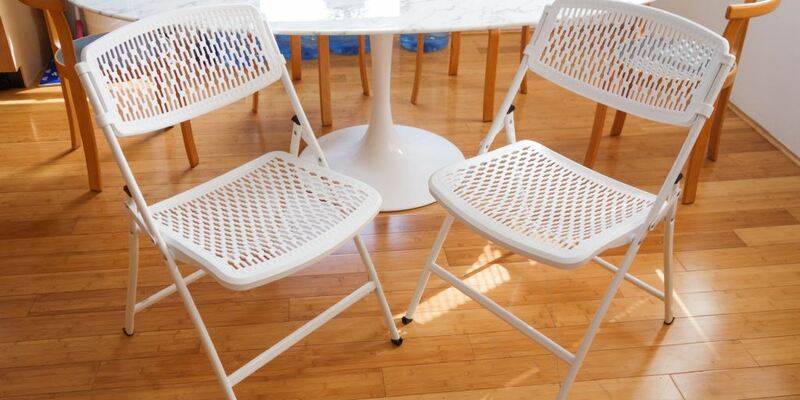 It has solid horizontal lines with dotted vertical lines that combine to make a grid. This is useful for writing, making calculations or drawing diagrams quickly. The cover is a waterproof polydura that protects it from scratches and stains and the binding is wirebound at the top with twin impact resistant rings that retain their shape in your bag or pocket. The specially designed Rite in the Rain black ink pens work exceptionally well with their companion notebooks as well as with regular paper. 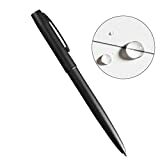 It is a click pen so it can be used with one hand and it doesn’t skip when writing meaning that it will write over wet spots, rain drops, grease, sweat and dirt. It is also pressurized and can write in any direction including upside down. All these factors means its great for both everyday usage, outdoor environments and emergency survival where you may need to leave notes. It can even write in -30 degree weather! If you use a fountain pen and you want a pocket notebook with better paper then you’ll want to go with Nock Co. They are a small brand with limited production that was formed to make pocket notebooks for fountain pens. 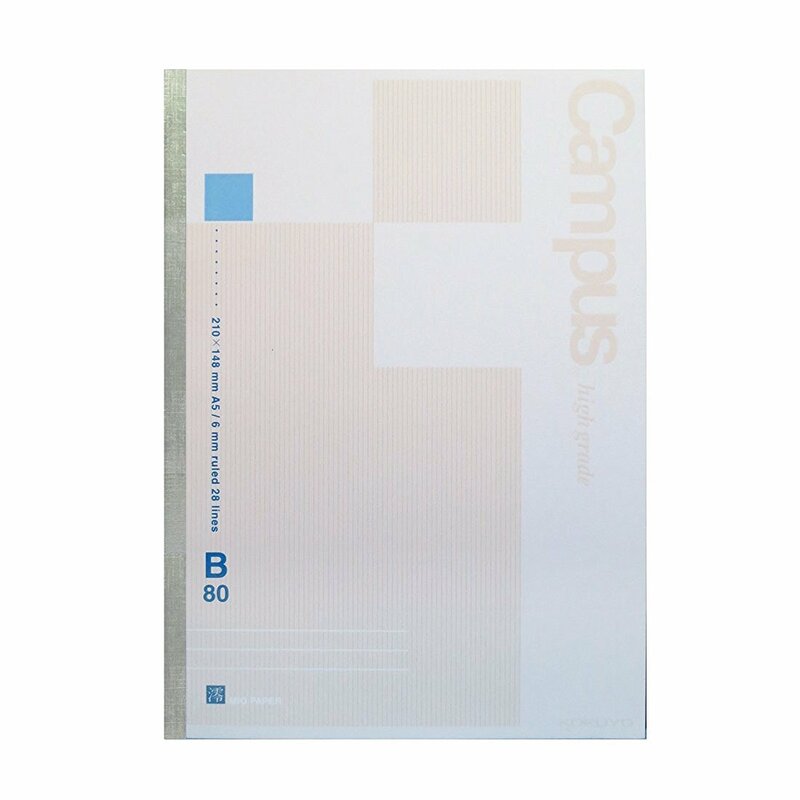 Their paper quality is 90 gsm and smooth with almost no bleed-through and little show-through. 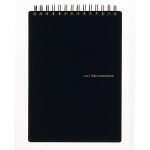 It is very similar to Leuchtturm paper and the notebooks easily slide out of your pocket and flip open like a notepad. Their DotDash pads are almost the same size as Field Notes, coming in at 3.6″ x 5.5″ with top-bound staple binding and 48 pages. They also have a larger DotDash pad at A5 (5.8″ x 8.3″) with top-bound spiral binding and 84 pages. All their notebooks, like their names, have dot dash ruling. You won’t find better pocket notebooks for fountain pens. The Midori Travelers Notebook is a great, inspiring notebook from a Japanese brand well-known for their quality and love for notebooks. 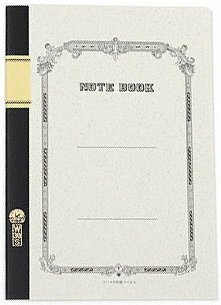 This is the type of item for people obsessed with quality notebooks and like to splurge every once in a while. Its expensive, but its high quality. The leather has a rich coffee color and will age beautifully. The edges are burnished and the presentation is top notch. The charm of it comes from repeated use. Its for the type of people who can appreciate aged and scratched up leather while protecting the notebook from the wear and tear of travelling. It has a nice size to it too — long and slender and not bulky. 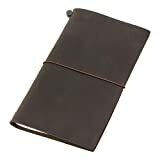 Its a great size for journaling or as a day planner. The refillable paper is lightweight and ultra thin and perfect for travelling at 128 pages. Midori also offers a number of accessories and refills to go with their notebook. We suggest the useful Midori clear zipper pocket insert. It has one zippered pocket and one slip pocket and is great for holding business cards, paperclips or anything small within the notebook. The two notebook brands with the best paper quality in the world of course come out of Japan — Midori and Maruman. These brands truly care about the quality of their paper, what goes into their products and how customers use them. 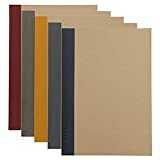 Maruman makes a wide range of notebooks in various formats including deskpads, spiral bounds, perforated, and so on, except they do not make hardbound. Their notebooks come at a premium price but the paper quality is better than any other brands. 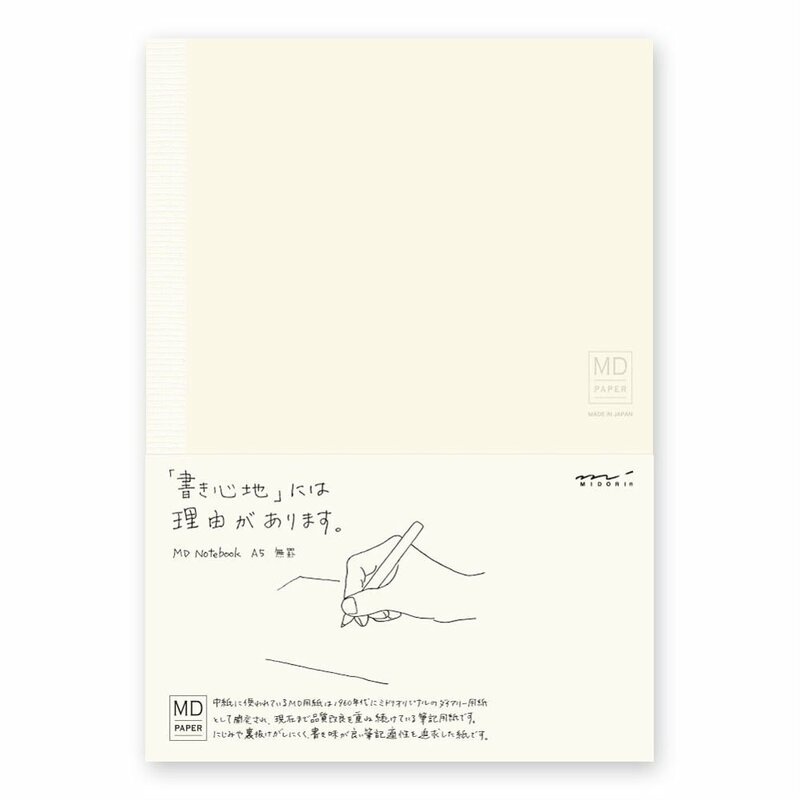 Midori will be a little more difficult to find but they make also make amazing quality notebooks, especially their popular Midori Travelers Notebook we recommended above. Rhodia’s premium notebooks are one of the few brands comparable in terms of style, performance and quality that is much easier to purchase. Another fantastic brand for fountain pens is Quo Vadis Habana. Below we’ve compared a number of premium notebook brands in different price ranges and how well they perform with fountain pens.